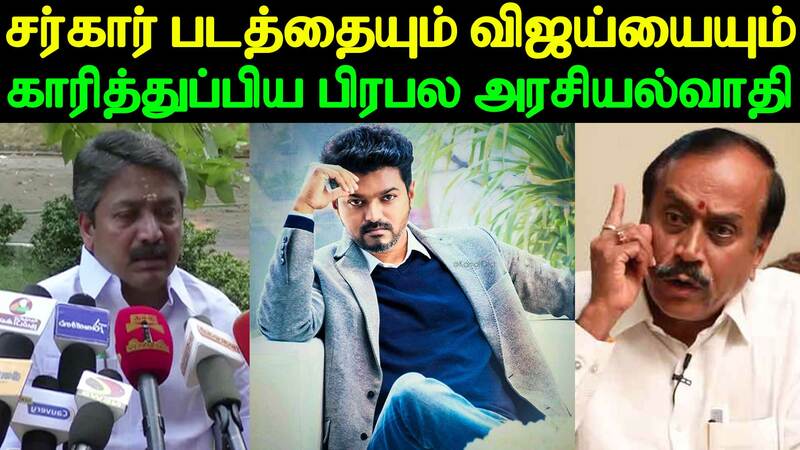 A day after the release of actor Vijay's latest film Sarkar, the Information and Publicity Minister of Tamil Nadu as well as the Law Minister of Tamil Nadu have warned action against the screening of the film that is currently running to packed screens across theatres in the state. Speaking at a press conference on Wednesday, Minister Kadambur Raju said, "People will not accept these political motives"
While rightly conceding that there was no relationship between the state government and the Central Board of Film Certification, Raju, however, said, "But still, it has come to our attention. We will also take this to the attention of the Chief Minister. If they(the makers) remove these scenes, then it is good. If not, we will think of the next course of action." Of Vijay, an actor who has been in the Tamil film industry for nearly three decades, Raju said, "It is not good for an upcoming actor like Vijay." Speaking to TNM, Law Minister CV Shanmugam said that he was merely expressing his person opinion on the film. “I strongly feel that all persons concerned with the film-- the actors, producers, storytellers, theatre owners exhibiting the film-- should be booked under the appropriate sections. I am not talking just about Vijay. Everyone has the right to criticise the government. But the film is inciting violence. That is a grave offence,” he said. The Minister added that he would convey his views to the government, if his opinion was sought on the matter. According to party sources, the AIADMK leaders had reportedly read reviews of the film that had called the film Vijay's political launch pad. The film critiques the giving out of freebies following elections in the state, a practice that both major political parties in the state-- the ruling AIADMK as well the DMK-- have indulged in, in the past. “Adding to this, Tamil news channels had also convened prime time debates on the topic, making it a big criticism of us. But even the DMK has given out freebies,” says one senior party member, explaining why the Ministers were rattled. The launch of the film in the city in October this year had also fuelled speculation of Vijay's political entry with the actor making an unusually politically-tinted speech.